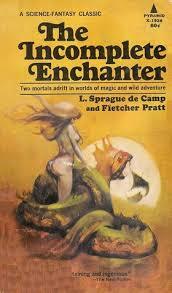 Very possibly: The Incomplete Enchanter by L. Sprague de Camp and Fletcher Pratt. Published in paperback in the 60's. The first part is The Roaring Trumpet, where Harold Shea uses symbolic logic devised by his boss, psychologist Reed Chambers, to project himself into the world of Irish mythology, but instead lands in the world of Norse myth. Actually, Shea sees through the illusions of the Norse Giants and helps Loki and Thor get the weapons.